Lenovo® ThinkAgile™ Network Orchestrator is a feature of Lenovo RackSwitch® CNOS (Cloud Network OS) network switch firmware that provides the ability for the infrastructure or server administrator to modify the network as needed to support typical tasks, such as the creation, starting, and shutdown of new machines, as well as manipulation of guest virtual machines on VLANs. These tasks are performed through the Nutanix PRISM dashboard and Acropolis hypervisor (AHV), or the VMware vSphere dashboard with the ESXi hypervisor, with the switches configured to detect the changes and act upon them. The purpose of this software is to enable the infrastructure or server administrator to see a single pane of glass and perform his or her tasks without needing to know details of network switch management. The switches learn of changes in the environment from PRISM or vSphere and dynamically modify their configurations as needed. This feature also enables the networking team to manage security and traffic prioritization of individual virtual machines if desired. 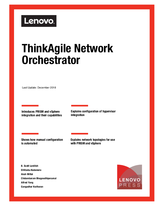 This paper covers the functionality and configuration of ThinkAgile Network Orchestrator. The paper assumes some level of familiarity with CNOS as well as with the Nutanix and VMware hypervisors and their respective management consoles.